The Museum has several Thomas Splints – the symbolic of the birth of orthopaedics – which could date from the First World War. Colonel Robert Jones, CB, promoted the use of the Thomas splint for the initial treatment of femoral fractures and reduced mortality related to compound fractures of the femur from 87% to less than 8% in the period from 1916 to 1918. Jones was the nephew of Hugh Owen Thomas (1834-1891), who came from a family of ‘bone setters’ and who is famous for inventing the Thomas Splint, which is still used today. Thomas’s work was not fully appreciated in his own lifetime. It was only during the First World War that his techniques came to be used. 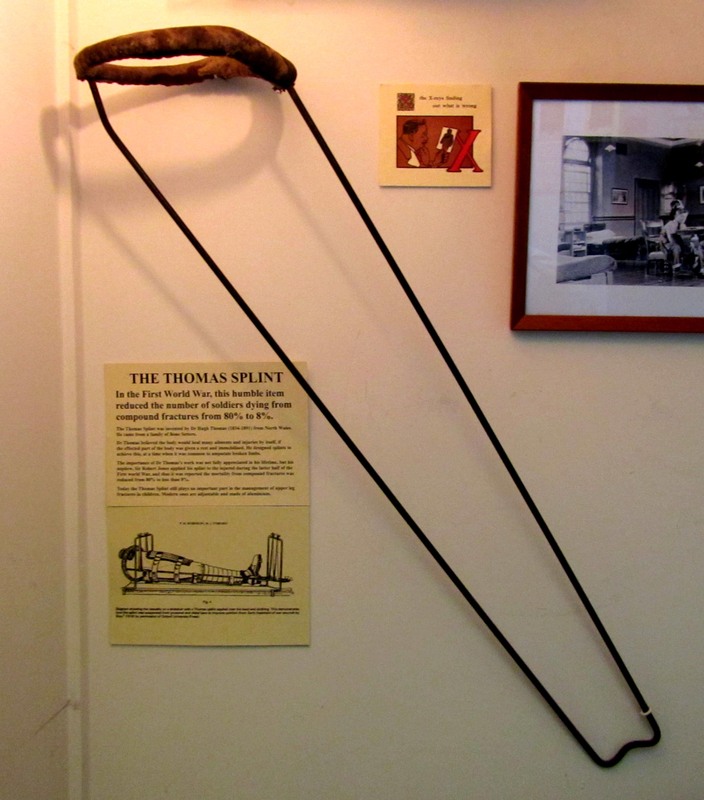 Thomas advocated enforced rest as the best remedy for fractures and tuberculosis and created the so-called ‘Thomas Splint’ to stabilise a fractured femur and prevent infection. Previous to this the leg would have been amputated, which was often a death sentence. Thomas was also responsible for numerous other medical innovations that all carry his name: ‘Thomas’s collar’ to treat tuberculosis of the cervical spine, ‘Thomas’s manoeuvre’, an orthopaedic investigation for fracture of the hip joint, the ‘Thomas test‘, a method of detecting hip deformity by having the patient lying flat in bed, ‘Thomas’s wrench’ for reducing fractures, as well as an osteoclast to break and reset bones.